Global powersports market, a highly lucrative vertical of the overall automotive and transportation sphere, has been gaining renewed acclaim lately. The industry primarily banks on the popularity of recreational activities that have been surging across the globe, on account of the robustly expanding tourism industry and the consequently rising interest for luxury sports. The demand for power sport vehicles such as snowmobiles, personal watercrafts, and ATVs has been tremendously increasing in recent times, having taken note of which, prominent powersports industry contenders have been going the whole hog to innovate an all-new range of vehicles for these recreational sports. Citing a recent instance validating the aforesaid, the Yamaha WaterCraft Group, a sub-division of the Yamaha Motor Corporation, U.S.A., has recently launched the 2019 WaveRunner line inclusive of a major redesign of the brand’s FX Series, commendable performance upgrades for the race-ready Yamaha GP1800R & VXR, and a high-performance EX model. Having pegged the title of being the fastest-growing personal watercraft brand in the powersports industry, Yamaha, through this launch, seems keen on further consolidating its position in the market. While North America is a global hub for the expansion of powersports market size, it has been observed that the Asia Pacific has lately been emerging as a highly popular investment ground for powersports industry. The reason for the same can be essentially attributed to the rising disposable incomes in the region that has led to the masses spending unabashedly on luxury sports, thereby accelerating the sales of ATVs, heavyweight vehicles, and the like. 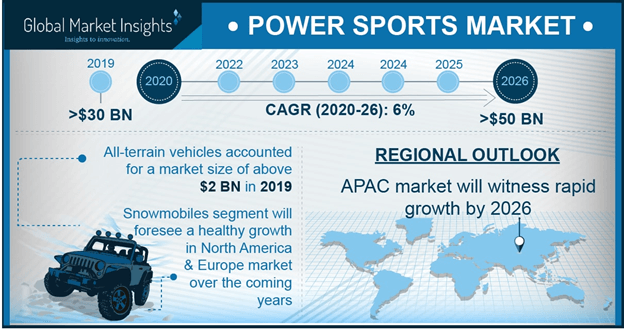 Led by the emerging economies such as India and China, APAC power sports market size is anticipated to register a modest CAGR of 4.5% over 2018-2024. The APAC powersports market has also been experiencing commendable growth on account of the fact that leading industry contenders have been vying with one another to pour in investments in the region and consolidate their stance in the regional business sphere. Prominent players such as Polaris have also been expanding their distribution channels to capture a sizable proportion of the industry share. Speaking along the same lines, it is vital to mention that Polaris is indeed one of the most powerful participants across APAC, especially in India. A popular American manufacturer of powersport vehicles, Polaris has been touted to pretty much be the leader in India powersports industry, especially in terms of ATV sales. As per estimates, Polaris sold 1,000 units of ATVs in India in the past three years. Out of all the sales in India by Polaris, 15% come from government sectors like police and defense. The company expects to sell another 3,000 units by 2020 due to the expansion of Powersport market and rise in demand for adventure sport. It is thus rather overt that the India powersports industry has been making commendable headway in the Asia Pacific business space, on account of the efforts of companies such as Polaris. Furthermore, the India powersports market has also been expanding rapidly owing to supportive initiatives such as ‘Make In India’ that are targeted toward strengthening the regional manufacturing sector. China has been another leading regional contender that is rather proactive in terms of manufacturing power sport vehicles. Indeed, the last few months have witnessed a massive change of dynamics in China powersports market outlook. The principal reason for the same may be attributed to the rise in the popularity of winter sports in the region in tandem with the ongoing tiff regarding trade policies between China and the United States. In the midst of a trade war that demands proposed tariffs on USD 60 billion worth of U.S. manufactured products, China has now been targeting the production of sow groomers and snowmobiles for the domestic ski industry, that has been impacting the regional power sports market trends. As per reliable estimates, the number of visits to China’s ski resorts has escalated to more than thrice in the last ten years. Back in the mid-1990s, China recorded close to 10,000 visits a year to ski resorts. As on 2017 though, 17.5 million visits to Chinese ski resorts have been recorded in the China Ski Industry White Book 2017. In addition, the Chinese government has been working relentlessly to expand the winter sports industry prior to when Beijing would host the Winter Olympics in 2022. The China powersports market has thus been garnering commendable momentum, thereby contributing to the growth of the APAC industry. Driven by the extensive efforts of industry contenders that have been striving to expand the scope of this market via small and bolt-on acquisitions and the robust popularity of recreational sports, powersports market is likely to traverse along side a highly profitable growth path in the years ahead. As per reliable estimates, global powersports industry size is likely to be pegged at USD 14 billion by 2024.